While on vacation I like to meet and chat with new people. After these conversations I always walk away a more enriched person. Last week was no different for me. While vacationing with family, I had the opportunity to meet and talk with a recently retired woman. She was gregarious, full of life and ready for the future. During our chat she mentioned that she and her husband, both retired engineers, made a major lifestyle change last year. They decided to sell their home, give away all of its contents to family and buy a Class A diesel motor home, aka a recreational vehicle (RV). Since then, she said, they’ve traveled the country from Yellowstone National Park to Key West, Florida. In all, she happily announced, they are living their best life now. I must say she is not alone. According to the Recreational Vehicle Industry Association, the RV industry has an overall national economic impact of $50 billion. Nearly 23,000 businesses exist to support RV-related enterprises. Manufacturers and suppliers create 44,000 jobs, $2.9 billion in wages and $16 billion in economic output. Looking ahead, RV wholesale shipments are expected to reach 539,000 units by the end of this year, a 7% increase over last year. This growth will mark the ninth year in a row for RV market expansion. 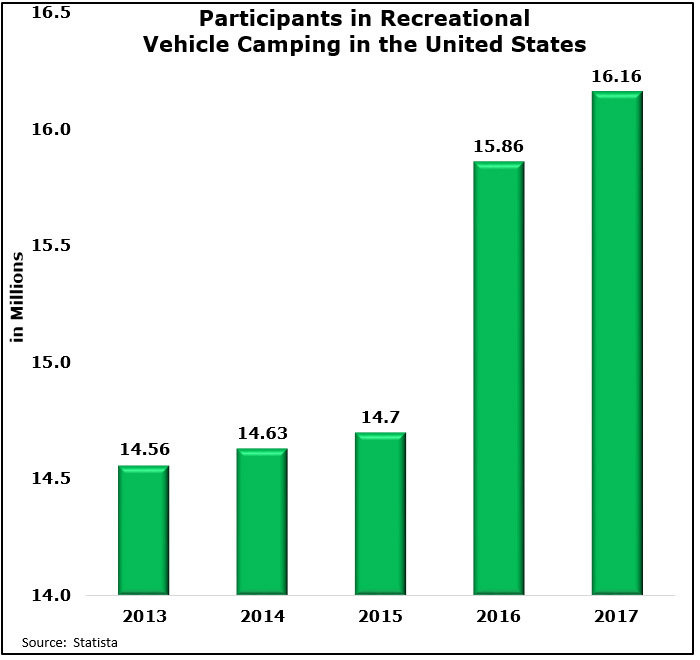 And the number of folks who participate in RV camping in the U.S. continues to jump higher. Since 2013, the number of participants has increased by 11%, or 1.6 million people. Statistics also show that the average age of an RV owner is 46 years old, while split nearly evenly among the sexes. Of the various RV makes and models, towables (RVs attached or hitched to a vehicle) are by far the most popular purchase choice, with an average retail price of $28,500. Overall, RV camping is a popular pastime … and a lucrative investment. 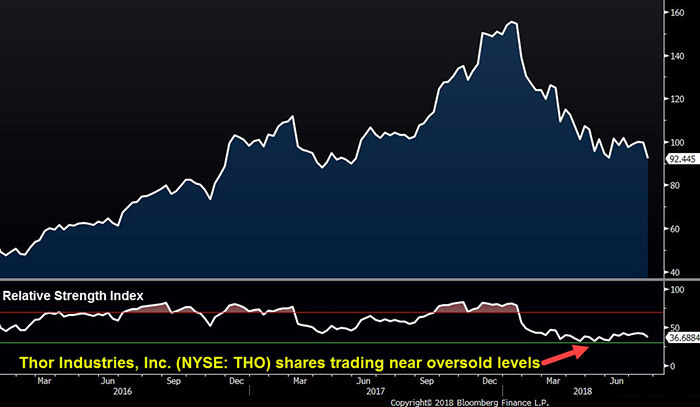 One company that stands out in this market is Thor Industries Inc. (NYSE: THO). Thor Industries is a $4.8 billion company that’s achieved unparalleled growth over the last few years. Revenues skyrocketed by nearly 60% from 2016 to 2017, from $4.6 billion to $7.2 billion. And revenues for 2018 are forecasted to increase to $8.4 billion. The company’s net income grows an average of 5.2% year-over-year while operating cash climbs steadily. Also, the analyst consensus rating on Thor Industries is overall positive, with nine buys and two holds. Year-to-date the company’s share price has been under pressure. However, a relative strength chart shows that its share price is trending near oversold levels. This means now is a good time to buy THO at a discount. And given the projected steady demand for the RV lifestyle, helped by campers like the enthusiastic woman I met last week, Thor Industries is in a great position to be a good long-term buy.